Hello and welcome to my blog! Please add your comments! 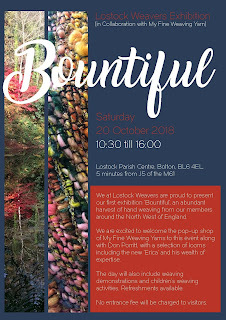 On October 20th 2018 is the first ever Exhibition and Open Day of our talented and enthusiastic group, Lostock Weavers. This will be open from 10.30-4 at Lostock Parish Centre, Tempest Road, Bolton, BL6 4EL, just a couple of minutes walk from Lostock railway station and on the 715 bus route between Bolton and Wigan. In addition to a display of hand woven items, there will be demonstrations of weaving and spinning, children's weaving activities, weaving yarns and equipment available for purchase and delicious cakes and drinks for sale. There is no entrance fee to this event. Contact me for further details! The first ever exhibition and Open Day for our weaving group! The group was started only a year ago and has a talented and enthusiastic membership of hand weavers from around the north west of England. All welcome! Spent a very enjoyable day teaching members of Eden Valley Guild. Here they are keeping very busy. I am putting together some photos of samples of weft-faced boundweave on a Rosepath threading, as a potential future workshop. Several of my weaving students have contributed to this collection, and I am grateful for their permission to use the photos. This collection is a work in progress! Another four days of weaving and feasting are over, and once again we had a fantastic time and some amazing weaving was created by our lovely participants! We also presented the woven cushions to the staff and Friends in a lovely informal ceremony. I was so busy that I didn't get time to take many photos of work! I will of course post these as soon as they start coming in from the participants! Looking mighty fine! 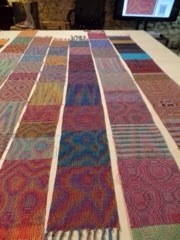 Now all I need to do is weave the remaining 20 metres! It has been too long a time since my last post. 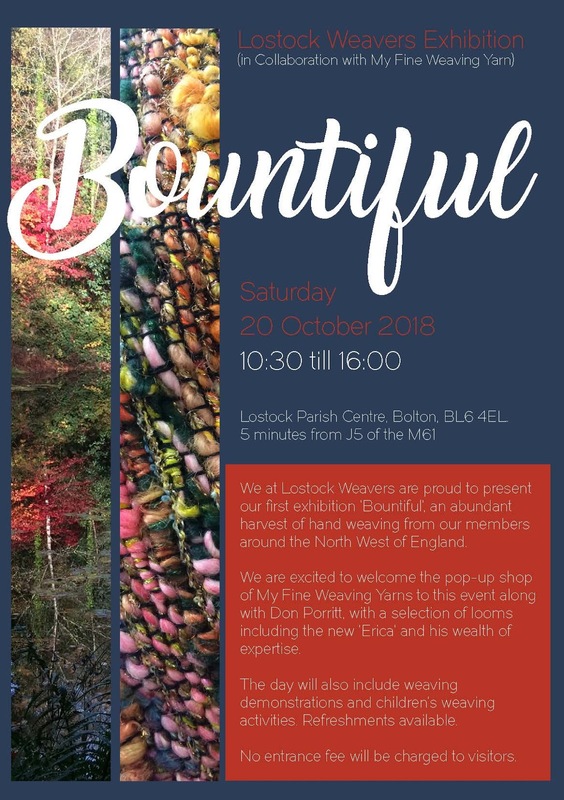 Life has got in the way, but now things are improving and the most exciting news is that we now have a regular monthly weaving group, right here in Lostock and available to weavers from around the north west of England. This is not a class, or a guild, but an opportunity for weavers to bring a loom, get together and weave, talk about weaving and exchange ideas and knowledge with like-minded people. Lostock Parish Centre is a modern, light and well-equipped venue only 5 minutes from Junction 5 of the M61 and less than 5 minutes walk from Lostock railway station. The first gathering was held on Saturday May 13th, and the next dates booked are June 17th, July 15th, August 12th, September 16th and October 21st. Places are limited so it is essential to pre-book by contacting me at janesflanagan@yahoo.co.uk or on 07772 455536. The group runs from 10-4 and there is a charge of £20 per person per day, which includes drinks and biscuits-but please bring a packed lunch. 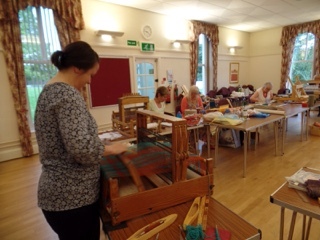 Another happy and productive weekend of weaving took place at Waddow Hall last month! The September 4-day workshop is now full for this year, and next February's weekend, from the 16th-18th is almost full already! There are just a couple of places remaining. Please email me for details. Weaving Weekend at Waddow February 2017! There are just a couple of places remaining now for the weaving weekend in February! It's from Friday 17th to Sunday 19th at Waddow Hall, near Clitheroe. The price of £250 includes full board (and I mean full!) in an ensuite room and all tuition costs. The workshop is suitable for all levels from complete beginner to advanced, and looms are available to loan by arrangement. A deposit of £40 secures your place, with the balance due in mid November. Get in touch if you would like more information! Places are filling up fast for the Waddow Weekend of Weaving from February 17-19th 2017. Once again, there will be a diverse range of looms and techniques being used and the teaching areas of my brain will no doubt be stretched to their limit as usual! Fortunately the food and accommodation is still as excellent as ever so I'm not too worried. After the success of the first four-day weaving workshop, I have also reserved Waddow again for 31st August to 4th Srptember next year. It's a long way off, but I am now taking expressions of interest. 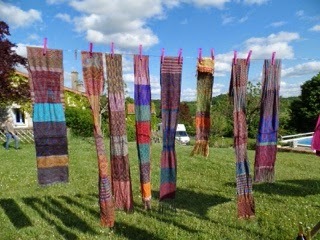 Had a great time once again-four days-lots of weaving, excellent food and good company-what more could we want! 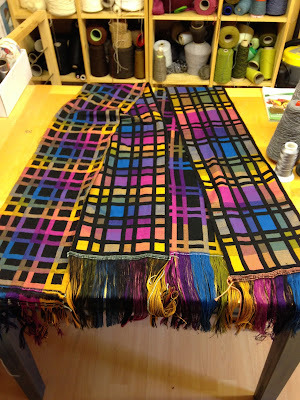 I never made it to Kendal Wool Gathering, due to illness, and this year I have decided to make quite a few changes. 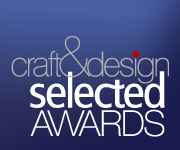 I shall be at the Rheged Knit and Stitch as usual on April 17th-18th, but this is the only event as such that I am planning on participating in this year, and where I shall be taking my Estonian wool, which is a real shame and I am so sorry to those loyal customers who love this product. But I simply don't have the time to maintain the website and keep up to date with orders as I am now doing so much more teaching. I am not applying to Woolfest or Yarndale but I do have some bits and bobs of stock left so do email me if you are interested in the Estonian wool-but I shall not be re-ordering for the foreseeable future. This year I need to concentrate on my teaching and on my own design and weaving work-moreover, and probably more importantly, on improving my own health. As well as arthritis in the creaky old knees I seem to have developed a back problem for which I shall be having intensive physiotherapy. In better news!!!! No creaking joints were going to keep me away from Waddow Hall and 15 of us enjoyed a wonderful weekend of weaving again recently. I wish I had taken more photos but those of you who were there please do send some on so that I can put them on the blog. There was such an array of different looms, yarns, apparatus, not to mention Carol and her "Spinning Corner", and the constant, well what is the collective term for the sound made by a roomful of weavers? A THRUMBLE maybe? The four day course in September is now full apart from those last minute places which always seem to materialise and which I never seem to be able to turn down. That's enough from me for now-what have I forgotten? Loads I'm sure. Tomorrow, Saturday 28th November, is the wonderful Xmas Fair at Helmshore Mills Textile Museum, with around 40 stalls, festive entertainment and great food. However, sadly this may be the last such event at Helmshore, at least for the foreseeable future, as drastic financial cutbacks by Lancashire County Council have meant that the mill and Queen Street Mill in Burnley are due for closure early next year. A campaign has been started to try to find investors, to fundraise and basically explore every possible avenue to keep this vital part of our cultural history alive. Show your support by visiting the Xmas Fair and signing the petition, becoming involved as a volunteer, writing to your MP and anything else you can think of. I shall endeavour to post updates as soon as I know what is due to happen next. I had a fab time at Yarndale-my most successful selling event to date! It was great to see so many familiar friendly faces and make contact with customers new and old. 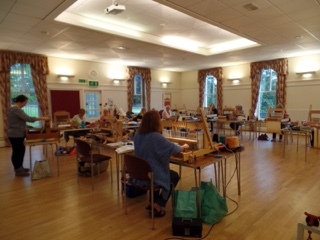 There was also a lot of interest in the September weaving course at Waddow next year. I need to update my website and get organised. After a few days enjoying the sun in a camper van in Scotland (yes we really did!) next on the horizon is Kendal Wool Gathering in 3 week's time. I need a couple of weeks to recover first. 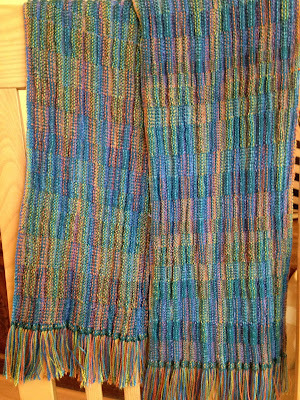 Getting ready for Yarndale in a couple of weeks...I have finally finished weaving the double weave windows scarves and they are waiting to be fringed, washed and pressed. 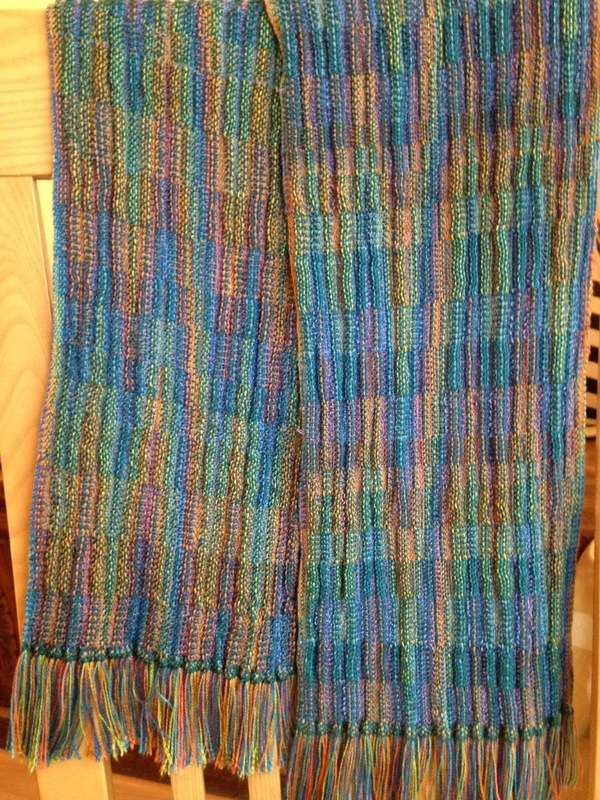 Also finished is the iridescent double weave scarf in Tencel and colcolastic. Just labels and packing boxes to do and I will be ready....I will be on Stand 31 so come and say hello! After a couple of years away, I am returning to my first love of double cloth, and weaving two block/two layer double weave windows in 2/2 twill. If you do the maths, you will see that this requires 16 shafts! 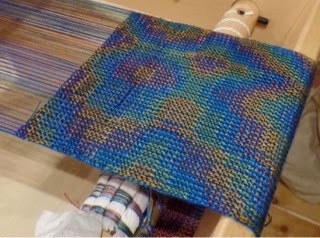 The yarn is 2/48 wool sett at 80 ends per inch-40 per layer-and 80 picks per inch-so progress is slow. The reverse will be equally interesting but we will have to wait until the first scarf is off the loom before I can post of photo of that. On Saturday and Sunday the 13th and 14th June, it will be the third Follow the Thread event at Helmshore Mills Textile Museum! I shall, of course, be there again, demonstrating weaving and selling Estonian yarns, batts and pencil roving.....together with lots of other textile enthusiasts, including knitters, crocheters, spinners, embroiderers and others. There will also be alpacas to admire and opportunities to try your hand at a number of wonderful textile crafts. I have just returned from a wonderful week in France, where I took part in a 3-day weaving workshop led by Marian Stubenitsky, based on her book "Weaving with Echo and Iris". 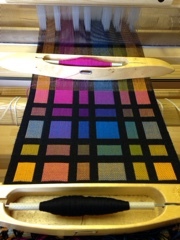 We focused on 8-shaft designs using network drafting to devise a threading in four colours, trying out a range of tie ups and lift sequences to create a variety of single and double layer fabrics, each one of which showed iridescence in a different way. 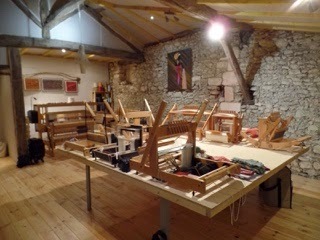 It was a fascinating, challenging and above all enjoyable few days in a beautiful Dordogne setting-with a great teacher and a group of like-minded weavers. Oh and not forgetting the excellent food and accommodation provided by our hosts, Gail and Mike Smith!